Copyright © 2014 MRC Laboratory of Molecular Biology. 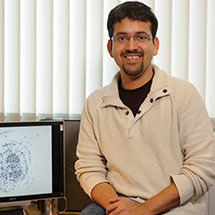 Madan Babu, from the LMB’s Structural Studies Division, has been announced as the recipient of the Protein Society’s 2014 Protein Science Young Investigator Award. The Protein Science Young Investigator Award recognises important contributions to the study of proteins, by a scientist in the early stages of an independent career. It is named after The Protein Society’s academic journal, Protein Science. Madan is the first LMB scientist to be honoured with this prestigious award. Madan has been a group leader at the LMB since 2006. His lab is interested in understanding how regulation is achieved in cellular systems, with the aim of gaining a genome-level understanding of why certain mutations cause disease. Madan’s group is currently investigating properties of biological networks and intrinsically disordered proteins to understand how they achieve regulation and influence genome evolution. His group employs an interdisciplinary approach, combining computational and experimental methods to study regulatory processes at multiple scales of complexity (ranging from the molecular to the genome level) across a wide range of model organisms. The Protein Society award recognises Madan’s contributions to the understanding of the principles of regulation in biological systems, especially in the fields of intrinsically disordered proteins and gene regulation. As part of the award, Madan has been invited to present a talk at the Protein Society Annual Symposium, in San Diego, in July 2014.